You are the development director of My Nice Nonprofit. Our mission is to do good things—and that’s exactly what we do. Because of our work, our clients, and we serve over 5,000 a month, have nice things happen to them. As a result, they are better citizens of our city, our state, our country and the world. Our programs are all completely funded via program fees and government support. Your charge is to raise the money to pay for your salary, the salaries of some other non-program personnel, office supplies and equipment, and other such things. Go to your ED and ask please, pretty please, can you define a program for which we can raise funds? Continue raising funds only via a gala on the grounds that no one much cares what the gala supports? Throw up your hands and whine to everyone you can that you cannot fundraise for this organization? 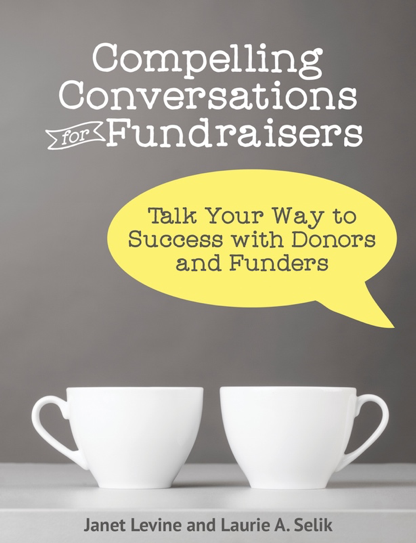 Fundraise by using the excellent outcomes your organization can talk about as the basis of your efforts? Put this way, of course, it is obvious that the correct answer is “D”. And yet, I regularly talk to development directors who cannot figure this out. Really? Does she honestly believe that? How hard is it to talk about the things you do, the results you achieve, and ask donors to be a part of and to join with? If you don’t understand that the things that still need money are things that are necessary for the organization’s, and hence the programs’, success, you really don’t understand how things work. If an organization can’t turn on the lights, turn up the heat, and pay for insurance, supplies, and yes, salaries, it cannot do its work. So asking donors to support your work rather than the lights, heat, insurance, etc., is not being disingenuous. It is being factual. And if you raise more than these needed funds, who knows? Maybe there is an additional program that can be started, more people who can be served, an endowment that can be built so these good works can continue forever. This entry was posted in fundraising and tagged Ask, development, Endowment, fundraising, results. Bookmark the permalink.